Do mobile maps need more layers? 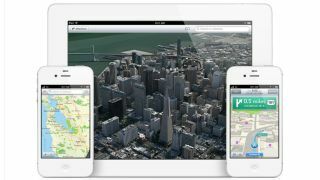 Is Apple Maps due for another overhaul? A newly published Apple patent suggests that the Apple Maps app could someday feature new types of interactive layers that make the navigation experience easier. Users of Apple Maps are used to the experience being more difficult, so this would be a nice change. The functions described in the patent, which is titled simply "Interactive Map," go far beyond the layers available in existing mapping apps (satellite view, traffic overlay, weather, etc.). The map layers Apple has proposed adding include data relevant to the road you're traveling, specific types of businesses and more. In one example, this hypothetical new Apple Maps would allow users to tap a road and thus display a layer of information only pertaining to that road: junctions, off-ramps, accessible businesses, etc. Or, if you're on the road and feeling hungry, it could display a map layer that only shows nearby restaurants, rather than all nearby businesses. The same goes for if you run out of gas or tear a hole in your pants on a night out; Tap that business-specific layer, and you'll see all nearby gas stations or pants stores, and nothing else. You could also select layers that show only highways, when you're driving long distances, or only side streets, when you want to avoid highways. There are more location-specific applications as well. Touching an airport on the map might bring up a flight schedule, or touching a restaurant might bring up a menu. Still other types of map layers might tailor the map to your specific needs as a tourist, commuter, or other type of traveler. Relevant information, like the history of a monument or other tourist destination, could appear automatically on the map. On the flip side, this feature could also be used to display ads from nearby shops. And the patent hints at custom layers that users would be able to program to show whatever businesses, roads and other points of interest they choose. Even navigation itself would be easier; The patent outlines how tapping two points simultaneously could produce a route between them instantly. None of this functionality is possible in existing map apps, but it's not difficult to imagine Apple adding it to Apple Maps in the next iOS update. And this hypothetical layers-centric version of Apple Maps could interact quite nicely with a virtual personal assistant like Siri. Speaking of Siri: TechRadar asks, "Siri, why do I hate you so much?"